I first came across Ezme Salatasi in North London, oh yes the glamorous life for me. I lived in a part of London that has a large Greek, Turkish, Greek-Cypriot, Turkish-Cypriot population, along with just about every other nationality you can name, I loved that about London, it felt like living in the World. And along with the different nationalities came the bakers and delis, restaurants and take-aways; some smart with tablecloths and napkins, gilded chairs and tinkly music, others more basic with only a few items on the menu, simple tables and wobbly chairs, and invariably someones granddad sitting in the corner looking wistful or grumpy depending on the granddad. Many had an open indoor barbecue pit and a bread oven, they all served great food. Everyone had their favourite place to eat kebab or lamb stews or borek or meze. Mine, I’ve forgotten the name now, had a BIG watch on the wall, I seem to remember it being pink plastic but that might be my memory…..
What I remember most and now recreate at home is the Ezme Salad. “First things first, ‘ezme’ is a Turkish word that means ‘crushed’. You’ll also see the word used to describe any other Turkish food that involves a bit of crushing, smashing up or grinding”. I read countless recipes, some versions with vinegar, some with lemon, with tomato puree and without. Many have chopped cucumber in and yes you guessed it many versions don’t. If you have a fresh cucumber then go ahead and chop it up finely and sling it in, this is a salad where the more the merrier is the mote-juste. Firstly how to describe it? Fresh and Zingy are words that spring to mind, read the ingredients and make it yourself and you will see what I mean. It is a simple mix of chopped tomatoes (traditionally beefsteak tomatoes but I use what I have to hand), bashed a bit, a dash of olive oil, a squeeze of lemon juice, chopped garlic, a finely chopped de-seeded red chilli, a large handful of fresh flat leaf parsley and a pinch of salt. Then leave it for maybe 15 to 30 minutes to let the flavours soak through. Don’t put it in the fridge, there really is no need to chill the tomatoes to the bone! It’s that simple my friends. It’s perfect on its own, as part of a meze, scooped up with flatbreads, alongside cheeses like feta and Haloumi or grilled fish and meat. If you want to oggle outrageously gorgeous photos and sumptuous heritage / heirloom tomatoes then pop over to my friend Stacy’s blog Down to Earth Digs. Most of all take a look at The Sample Platter post it will have you ooohhing and aahhhing and yup probably drooling too. Frankly the tomato platter is to die for. I mean figuratively speaking. 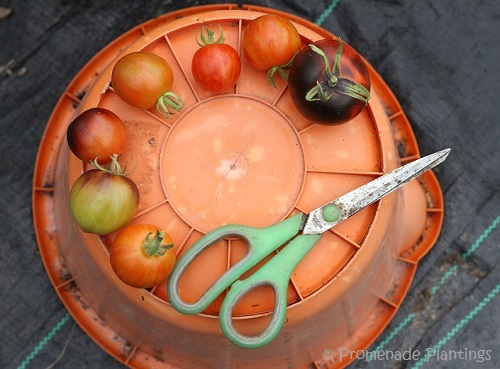 It’s something to dream of and aim for – not the dying, the tomatoes ! My measly efforts pale into insignificance, but who’s counting or should I say who’s sulking in the British corner?! Blight really struck the tomatoes this year, in fact I’ve just pulled another two plants out of the garden and I’m about to dig up the remaining plants in the greenhouse where I will remove the top few inches of soil/compost and start all over again. The upside is that if I do this now I can sow lots of salads in the space left behind. So winter lettuce here we come! The only varieties I have been able to save for next years seeds are Green Doctor and Fablonelistnyj, varieties that I picked up in a seed swap. Green Doctor has a beautiful green-red tinged skin, a cherry variety that has a touch of sharpness and has done well in this lack-lustre summer of ours; as has the Fablonelistnyj a bright yellow knobbly cherry, again a little sharpness comes through in the taste-test-offs. You were wondering where the bucket came into this weren’t you? Yes I have taste-test-offs. 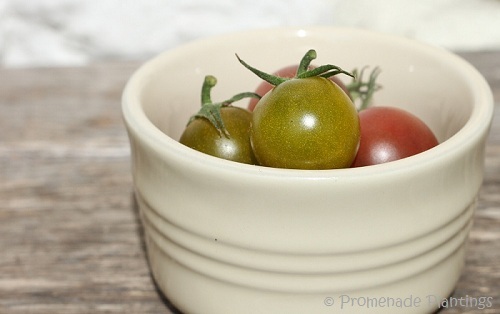 I need to decide what to grow next year – my tomato bucket list ! Previous Post Previous post: A night on the tiles pickled beetroot ~ a hangover cure? I loved living in North London, too. I lived in Tufnell Park, just to the West of Holloway Road, and these days I live in a part of Copenhagen that has been famous/infamous for its multicultural identity for decades. It’s just so amazing to be able to travel the world by walking down the street. I’ve been making a tomato salad just like this for the past few weeks, but I didn’t know it had a name. Now I know what to call it! I especially like it made with cherry tomatoes. Well it must have been called Kate’s Yummy Tomato Salad ! I sometimes add toasted hazelnuts in, delic ! This salad is calling to me like Sirens! Sounds simply deliciously perfect this time of year. And I love that way of preparing a dish – the way our ancestors once did – taking what’s abundant and dribbling this, tossing a bit of that, slinging quite a good gob of this other. Until it tastes right. This is that kind of dish. One that knows what it is. I’d like a good bowl of it about now! You know Antoinette that my favourite kind of cooking is a dribbling this, tossing that, slinging the other! In fact that’s how I made a Thai Green Curry last night, yum !! I too lived in North London (Islington – for seven year). I was in London this week and went back to have a look at the road I lived on and the area in general. Coincidentally, one of things I looked out for was a Turkish restaurant where I remember having some good meals. I couldn’t remember its name but it seem to have gone as it wasn’t in the spot that I thought it should be. Yes it is odd to go back. It felt strange walking around parts of Islington this week and struggling to remember what was where. Odd but in a good way. 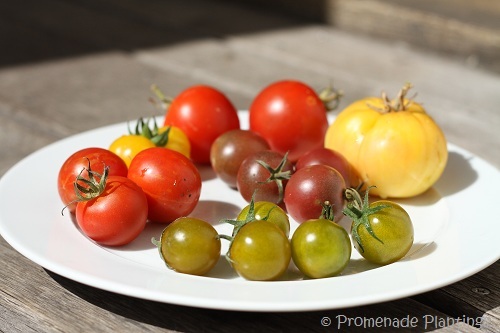 I love all the different colors of your tomatoes! If you ever get to Chicago you have to take a walk down Devon Avenue, which is two or three miles from where I live. If you love food, this is the place to be. Indian, Pakistani, Georgian, Russian, Assyrian, and more. I imagine London is a great cosmopolitan city for food, but if you get a chance you should give Chicago a try. With tomatoes fresh from the garden, simple works best for me. I do like the sound of this salad, Claire, especially letting it sit for a spell to let the olive oil and lemon work their magic on the smashed tomatoes. Yum! I will be enjoying this salad before the weekend is up. It sounds to good to wait any longer than that. Thanks for sharing the recipe, Claire. Wonderful post! Learnt so much about the dish and heriloom tomatoes. Ezme means crushed. The salad sounds wonderful. The best things are the simplest!! I have not been in the blogosphere for a while, so let me tell you I love the new look! It’s lovely to see you back in blogland 🙂 and now I’m looking forward to some new treats from your kitchen ! I wondered what you were doing for 6 hours, now I get it 🙂 Hope you managed to get your tomato salad Tandy ! You are making me homesick with all of these yummy heirloom tomatoes. Simple recipe and that compliments these beautiful tomatoes well. 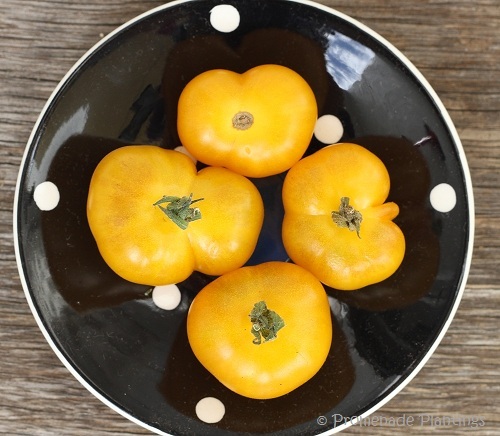 A good heirloom tomato does not need much to make it taste great. Awwww BAM, tomato season will soon be over and I’ll be back to inventing ways to liven up spinach, kale and chard, lovely but nowehere near as special as tomatoes ! Tomatoes are so versatile–I love seeing new recipes. I think I have 6 to use this year. Bashing tomatoes sounds especially delicious. Finding ethnic dishes that I can duplicate makes my heart sing. With good, fresh tomatoes the one you share is a winner. Fabulous Linda, that pleases me no end to have been able to share something you can recreate at home ! I will definitely try ezme tonight. My DH’s grandmother taught me the simplest garden salad: peel tomatoes and onions. slice tomatoes very thin, salt layer, slice onions very, very thin, add on top, sugar this layer. Continue layering. That’s it! Try it. Thanks again! Your salad sounds amazing, now I NEED to try that, I wonder if I could sneak in a layer of cucumber? Oh and I looked up Esme, and fortunately it means something entirely different and comes from France – all to do with love. I just hope it’s not crushed love ! It is nice that you got a few more tomatoes before you had to pull the rest of your tomato plants. I will be trying your salad with the addition of the nuts that you suggested…sounds great. Hi Karen, I forgot to mention the nuts in the original post, they do work well (in my mind) in the salad. I’ve also added pinenuts before now, but do like the hazelnuts too. The only tomatoes I have are cherry tomatoes and very few of those. I’ve been racking my brain trying to think of a way to use them differently…and this sounds perfect. I will give it a try. Love the idea of alongside a fish or meat. That’s great Betsy, I love the sweetness of cherry tomatoes, they are also easy to grow at home as they ripen quickly ! Fabulous ! There are so many great varieties to chose from, but whatever you grow they will taste delicious – garden warmed and straight into a salad !